Better still, the more you use this tip, the more time you'll save. And, as you'll see, it couldn't be easier. And, last but not least, if you read all the way to the end, there's a free gift for you! March 3 is just around the corner and this is probably the last post I'll write before Working Smarter for Mac Users ships on March 3 and the price goes up. So, if you want to save a few bucks, please click the big blue button and pre-order your copy before March 3, OK? Moving right along... let's take a look at another tip from Working Smarter for Mac Users... In a previous post I talked about improving your typing skills; in this post we'll look at keyboard shortcuts—which are another skill I recommended in the first chapter of Dr. Macintosh (1989) and still recommend to this day. Using keyboard shortcuts is all about reducing your dependence on the mouse. Many of the things you do with your mouse can be done faster and easier using a keyboard shortcut. I can’t remember the last time I opened this menu to use any of its commands. They’re so important and I use them so often, their keyboard shortcuts are embedded in my muscle memory. It would behoove you to memorize them all (or at least the four in the middle: Cut, Copy, Paste, and Select All). Command+4 for Cover Flow view. See! Isn’t that faster than taking your hand off the keyboard, grabbing the mouse, moving the cursor to the View menu, and then clicking an item? I used that menu as an example for a reason: You want to memorize those commands or at least the first three (unless you’re among the handful who find Cover Flow view useful). In any event, switching views quickly make it easier to work in the Finder. For example, if I am browsing a folder with a lot of pictures in List view (background window in image below), I just press Command+1 to switch to Icon view so I can see thumbnails of the images (foreground window in image below). Switching Finder views with a keyboard shortcut is handy, but it’s merely one of the thousands of shortcuts available in the Finder and almost every Mac app that can save you oodles of time every day. So, look for these shortcut symbols in menus, and memorize the ones you use most. 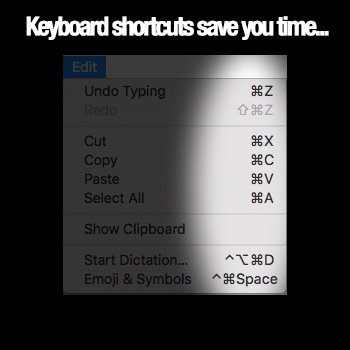 Trust me, keyboard shortcuts are faster every time; you’ll save many minutes every day not reaching for the mouse/trackpad or moving it up to a menu item, which slows you down more than you think. I created a PDF you can use to memorize some of the more useful shortcuts; download 'em, tape ‘em to your monitor, and then don’t remove them until your fingers automatically perform these shortcuts every time and you never think about reaching for the mouse. I know it might seem weird that I’m telling you to print it and hang it where you can see it, but that way you won’t need a mouse to find it quickly. Plus, if you only have it as a file on your hard drive, you’ll surely forget about it. If you have comments or questions, I hope you'll leave them in the Comments section below; I try to respond within 24 hours (and usually a lot sooner than that). Last but not least, I have a big favor to ask of you: If this post (or any of my posts/books/columns/etc.) has helped you become more productive or use your Mac better, faster, or more elegantly, please use the Share button to help me spread the word. As a small (read: tiny), first-time self-publisher, I will be eternally grateful for your help spreading the word.